Quick, courteous communication via email can boost productivity and enhance customer relationships, while careless and unprofessional email can frustrate and antagonize customers, coworkers, and others. 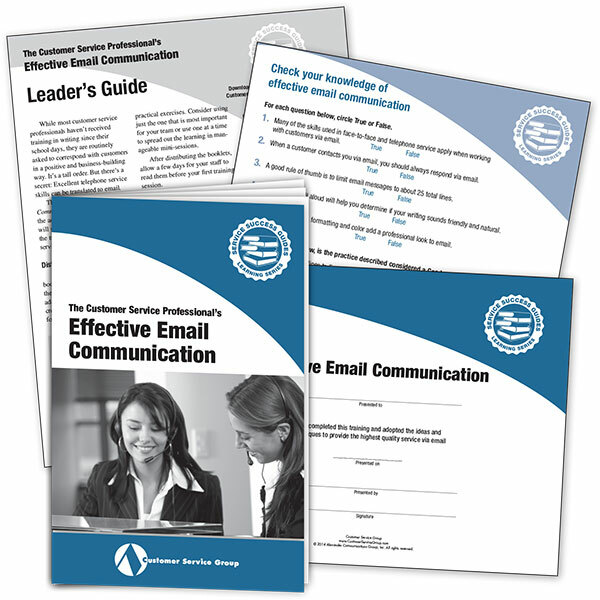 This four part training package will help your staff avoid embarrassing errors, increase efficiency, and make a positive impression with every email they send. The booklet’s unique approach shows readers how to transfer their customer service skills and techniques to written text. It’s a practical approach that reinforces basic service skills and teaches email writing skills at the same time. Readers will find techniques, sample text, and examples that they can incorporate into their own email right away. Just as you listen carefully when speaking to customers, you must give that same level of focus and attention to customer emails if you want to handle them correctly. This involves reading carefully to determine the reason for the message as well as “reading between the lines” to determine unspoken or related needs. The goal, of course, is to make your response as complete as possible so that you do not create a frustrating chain of email with the customer. A good example of reading between the lines and answering unstated needs is seen in the following example. A customer writes to ask if dress slacks are available in plus sizes. Rather than a simple “yes,” a more complete answer alerts the customer to the limited range of colors available in plus sizes and directs the customer to the size chart on the company website. Getting good at finding a customer’s spoken and unspoken needs is hard. In a conversation, you can ask questions to draw out the information you need. But in an email, you can only work with what the customer has written. Fortunately, you can read between the lines to provide complete information. Also keep in mind that apologizing, empathizing, and agreeing can often be wrapped into the same sentence. For example, “I’m so sorry, I had a similar situation myself, and we certainly could have handled this better.” That’s a lot of good stuff in one sentence! Effective Email Communication is guaranteed. We want you and your reps to use this valuable resource and put its ideas to work in your department. Then, if you are not 100% satisfied, you may return your materials within 30 days for a full refund.